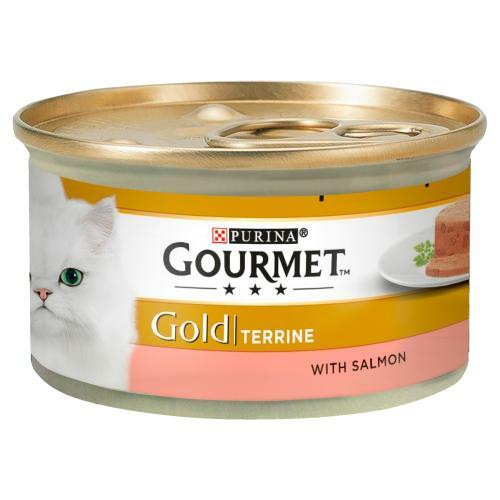 Gourmet Gold have created this tantalizing recipe of salmon, set in a succulent terrine, for a delectable & nutritionally complete cat food that even the most pampered puss will find absolutely irresistible! Your highly refined feline won’t be able to turn their nose up at this sumptuously smooth terrine combined with tender morsels of gently cooked fish for an exquisite treat every day. Even better, each tin of this balanced pet food, individually portioned to ensure every meal is deliciously fresh, provides total nourishment to keep your cat connoisseur looking beautiful and feeling fantastic. Ingredients: Meat and animal derivatives, fish and fish derivatives (salmon 4%), minerals, various sugars, derivatives of vegetable origin.